← The Art of Patience! Last year at the CGOA Conference, I received 1 skein of Lion Brand Landscapes yarn in my goodie bag. When I saw the yarn, I instantly fell in love with the beautiful colors! I knew I wanted to design something with it, but what can a crocheter make with only 1 skein of yarn? It’s not enough for a garment or an afghan, so I decided to design an accessory to show off the gorgeous colors in this yarn. 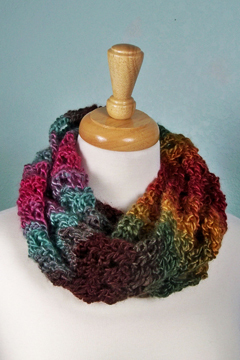 One of my favorite accessories to design, crochet and wear is cowls. Adding a cowl to an outfit can really dress it up with very little effort! And if the cowl is long enough, you can decide if you want to wear the cowl long or doubled up. Aren’t the colors in this yarn gorgeous? I think so! For this cowl design, I used an easy stitch pattern (so the colors of the yarn would grab a person’s attention, not fight with a complex stitch pattern)! This cowl pattern has a 2 row repeat, making it easy to memorize and quick to stitch. I used 1 skein for my small cowl in these photos (5 1/2″ wide x 48″ circumference), but you could use 2 skeins for a wider and longer cowl (the pattern includes instructions for a large size of 8″ wide x 60″ circumference). Either way, it’s an economical project to crochet with only 1 or 2 skeins of yarn! And since I love symbol crochet charts, I made a chart for each size of the cowl (the charts are included in the pattern). I’m curious! Have you had the pleasure of crocheting with Lion Brand Landscapes yarn? If so, how do you like it? Are you in love with the colors, like me? The color I used was #204 Desert Spring. But there are lots of other really pretty colors in this yarn. You can see all of the colors available in Landscapes yarn on the Lion Brand website here. 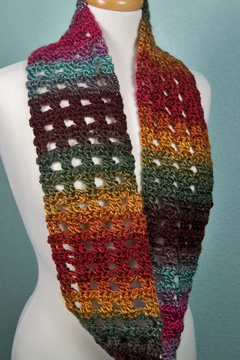 There are solid colors, as well as self-striping colors, like the one I used in my cowl. This yarn is worsted weight, 100% acrylic and has 147 yards in each skein. I seem to really be drawn to self-striping yarns these days! They’re so pretty! And the changes in colors help to keep my interest in the project, especially when the stitch pattern is easy! Since the projects made from self-striping yarns have lots of different colors in them, you can wear the items you crochet from them with lots of different outfits! I hope you’ll give self-striping yarn, like Lion Brand Landscapes, a try soon. You won’t regret it! And if you enjoy easy-to-stitch projects where the yarn does all the work (well, most of the work), check out my Landscapes Cowl pattern here. It’s only $4.95 for the full pattern, including symbol crochet charts. You can crochet as many of these cowls with the pattern as you’d like! As always, if you have a question about one of my patterns, I’m just an e-mail away! I’m more than happy to help YOU be successful with your crochet projects made from my crochet patterns! And if you’d like to join my group on Ravelry to discuss my crochet patterns, to ask a question about one of them or to join in a CAL (crochet-along), I’d love to have you join us! You can find my Ravelry group here. P.S. If you’d like to follow my blog, simply enter your e-mail address in the “subscribe to blog via email” spot near the top, right-hand corner of this page. I plan to bring you more interesting crochet content/patterns this year and for many years to come! This entry was posted in Crochet cowl, Crochet designs, Crochet patterns, Yarn review and tagged crochet, crochet patterns, published design, yarn. Bookmark the permalink. Very pretty, Susan! I got a skein of the Mountain Range Landscapes in my goody bag. I was in need a quick gift for a little gift exchange recently, and unfortunately I chose to include that yarn as part of my gift. Darn! I wish I had it now. I just might have to go get some. the Mountain Range colorway is really pretty. I’m glad you like this cowl. I’d love to see what you made with your skein of Landscapes yarn. Did you make a Ravelry project page for it? I’ll have to take a look at the Mountain Range color! Unfortunately, I gave that skein of yarn to someone. I’ll have to go buy some. I really did like the Mountain Range color.